A man is fishing while women in kimono cross Togetsukyo (literally, bridge to the moon) in Kyoto’s Arashiyama. The buddhist temple Horinji can be seen on the hillside at the far end of the bridge. The bridge received its poetic name after Emperor Kameyama (1249-1305) mentioned that the bridge appeared to stretch to the moon. Over the years, the bridge was repeatedly damaged or destroyed by floods and war, but always rebuilt. The bridge in this image was destroyed by a flood in 1892 (Meiji 25). At the same location, a concrete bridge was completed in 1934 (Showa 9), which stands to this day. For many hundreds of years until about 1948 (Showa 23), the river was used for transportation of people, goods like rice, barley, wheat and charcoal, and timber from as far away as Tamba. Because the river connected to the Kamo River in Kyoto and Yodo River in Osaka, it afforded unlimited opportunities for fast transportation long before highways and railroads existed. Even construction materials for the massive Osaka castle and several temples were transported down this river. After its narrow gorges were excavated around 1606, it became Kyoto’s main artery of commerce . Incidentally, the bridge marks the point where the Hozugawa (Hozu River) changes its name into the Katsuragawa (Katsura River). 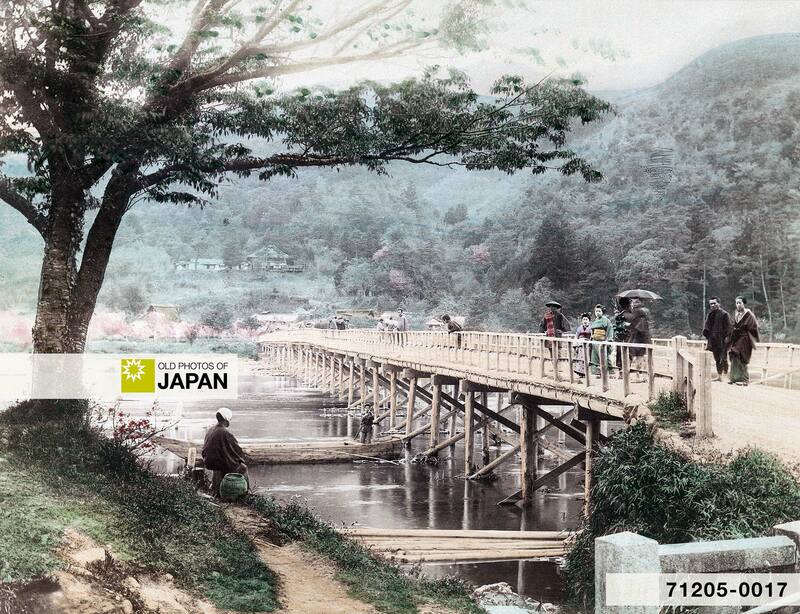 1 High-definition Image Database of Old Photographs of Japan, Togetsukyo . Retrieved on 2008-03-31. 2 Imperial Japanese Government Railways. (1914). An Official Guide to Eastern Asia Vol. II: South Western Japan. Imperial Japanese Government Railways. 3 Quite a few sources claim that the bridge was built by the priest Dosho (道昭, 629-700), a disciple of Kobo Daishi. But he lived two centuries earlier, so unless there were two people with the same name, this raises some questions. You can also licence this image online: 71205-0017 @ MeijiShowa.com. Although commercialization and modernization have even infected this little paradise in the western mountains of Kyoto, it is amazing how similar this place looks today. I love visiting this area; I have visited it countless times and still discover something new and beautiful each time. Indeed, Arashiyama is lovely. The gardens at Tenryuji in the spring, when everything is blossoming…oh, my. In the beginning of December they do colored lights in the bamboo forest, it’s crazy crowded but nice to see. Oh, I love those lights! Not the crowds, though. A recent newspaper article mentioned that Arashiyama has been regaining a lot of its popularity over the past few years. It had been loosing it to Kiyomizudera.